At last, the new phone of BlackBerry has finally arrived, the BlackBerry Z10. Launched along by iPhone 5 and Samsung Galaxy S3, HTC and Nokia Lumia, the new BlackBerry Z10 also hit the phone market. The BlackBerry Z10 measured 130mm x 65.6mm x 9mm, "chucky" and "durable" quality built that's like made for coffee spills and desk-level drops. 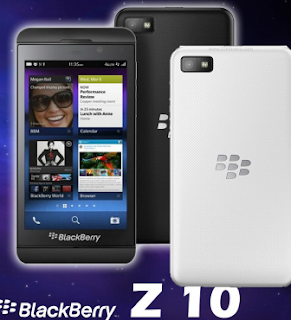 BlackBerry Z10 has 4.2-Inch, 1280 x 768 resolution display, much exceeds than the iPhone 5. Also the sharpness of Z10 is great. Because all the apps required a large amount of memory, the BlackBerry Z10 has 1.5GHz Dual-Core Processor. Together with its 2GB RAM, 16Gb internal storage, users will be satisfy with its capability to store apps and games. Also, it has hidden-inside 4G antenna and Micro HDMI where you can watch latest HD movies and TV shows from your BlackBerry phone straight to your HDTV. BlackBerry Z10 's camera has 8Mp on the back and 2MP in the front for picture taking and video calls. One of its camera features is the Time Shift, where you can edit and change the face back and forward, editing their eyes, open or close. BlackBerry Z10 is now available nationwide for only of pHp17,900.00 (estimated price). Visit some online stores and marketplace for more information and discount about the phone.